Players need to make a deposit and claim the bonus by UTC 23:59:59 every Wednesday. 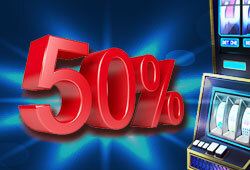 Once the bonus is claimed, players need to activate it and complete the wagering requirement within 3 days. Click on the “Deposit” button next to your username. Once you have completed the deposit process, you can activate the bonus under your player profile. Once players meet the wagering requirements, the amount can be treated as cash and can be withdrawn. When withdrawing your winnings, the standard Mongoose Casino banking and security protocol applies. Click here for full details on account verification. For more information about cash withdrawals, go to our Cash out page.